﻿ Hebrews 6:10 For God is not unrighteous, so as to forget your work and the love which you showed toward his name, in that you served the saints, and still do serve them. For God is not unrighteous, so as to forget your work and the love which you showed toward his name, in that you served the saints, and still do serve them. For God is not so unjust as to forget your work and the love you have shown him as you have ministered to the saints and continue to minister to them. For God is not unrighteous to forget your work, and the labor of love that ye showed toward his name, having served the sanctified, and who are serving. for God is not unrighteous to forget your work and the love which ye showed toward his name, in that ye ministered unto the saints, and still do minister. For God is not unrighteous to forget or overlook your labor and the love which you have shown for His name's sake in ministering to the needs of the saints (His own consecrated people), as you still do. For God is not [so] unjust as to forget the work you are doing and the love you have shown for Him, as you ministered to the saints [i.e., His holy people] and continue to minister [to them]. For God is not unjust, that he should forget your work, and the love which you have shown for his name by having ministered to the saints, and by continuing to minister. For God is not so unjust as to forget your work and the love which you have shown for his sake in serving the saints, as you still do. for God is too just to his promise not to regard your piety, and the love which you have shewn to the christian religion by the assistance ye have given to the saints, and still continue to give. For God is not unrighteous to forget your work, and the love which ye have shewn to his name, having ministered to the saints, and still ministering. For God is not unrighteous to forget your work and the divine love which you manifested in his name, having ministered to the saints, and ministering. For God is not so unjust as to forget the work you have done and the love you have showed for his cause, in giving help to your fellow-Christians as you still do. For God is not unrighteous, to forget your work and labour of love, which ye have shewed toward his name, in that ye have ministered to the saints, and do minister. For God is not unjust to forget your work and labour of charity which ye have showed in his name, having helped the saints and helping them. For God is not unjust to forget your work and fatigue of love, which ye showed to his name, having served to the holy ones, and serving. For God [is] not unjust, [so as] to forget your work and the love which you demonstrated for his name [by] having served the saints, and continuing to serve [them]. For God is not unrighteous to forget your work and labor of love which you have shown toward His name, in that you have ministered to the saints, and do minister. For God is not unrighteous that he should forget your work and labour that proceedeth of love, which love showed in his name, which have ministered unto the saints, and yet minister. God is not unfair; he will not forget what you have done, or the love you have shown for his sake in ministering, as you still do, to the saints. For God is not unjust; he will not forget your work and the love you showed for his cause, in sending help to your fellow Christians, as you are still doing. For God is not unjust so as to forget your work and the love you have demonstrated for his name, in having served and continuing to serve the saints. For God is not unjust so as to forget your work, and the love which ye showed toward his name, in that ye ministered and are still ministering to the saints. For God is not unjust, to forget your work, and the love which you showed for his name, having served the saints and [still] serving them. For God is not unjust, to forget your work and labour of love, which ye have demonstrated in his name, having ministered assistance to the saints, and still ministering. For God is not unjust; he will not forget the work that you did, and the love that you showed for his Name, in sending help to your fellow Christians--as you are still doing. For God is not unrighteous to forget your work and labor of love, which ye have shown towards his name, in that ye have ministered to the saints, and do minister. For God is not unjust so that He is unmindful of your labour and of the love which you have manifested towards Himself in having rendered services to His people and in still rendering them. For God is not so unjust as to forget the work you have done and the love you have shown His name in the service you have rendered for your fellow-Christians, and still are doing. For God is not unrighteous, so as to forget your work and the labor of love which you showed toward his name, in that you served the saints, and still do serve them. for God is not unrighteous to forget your work, and the love which ye showed toward His name, in having ministered to the saints, and still ministering. 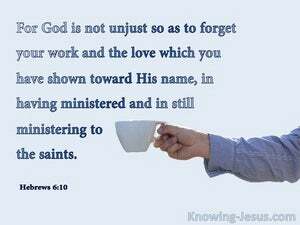 For God is not unjust to forget your work and labor of love, which ye have shewn to his name, by having ministred to the saints, and yet ministring. And whoever gives one of these little ones just a cup of cold water to drink because he is a disciple, truly I tell you he will in no way lose his reward." For whoever will give you a cup of water to drink in my name, because you belong to the Messiah, truly I tell you, he will in no way lose his reward. He, fastening his eyes on him, and being frightened, said, "What is it, Lord?" He said to him, "Your prayers and your gifts to the needy have gone up for a memorial before God. The Rock, his work is perfect, for all his ways are justice: a God of faithfulness and without iniquity, just and right is he. I commanded the Levites that they should purify themselves, and that they should come and keep the gates, to sanctify the Sabbath day. Remember to me, my God, this also, and spare me according to the greatness of your loving kindness. and for the wood offering, at times appointed, and for the first fruits. Remember me, my God, for good. He will remember all your offerings, and accept your burnt sacrifice. Selah. He who has pity on the poor lends to the LORD; he will reward him. "Go, and cry in the ears of Jerusalem, saying, 'Thus says the LORD, "I remember you, the devotion of your youth, the love of your weddings; how you went after me in the wilderness, in a land that was not sown. Shall evil be recompensed for good? For they have dug a pit for my soul. Remember how I stood before you to speak good for them, to turn away your wrath from them. Truly, truly, I tell you, he who receives whomever I send, receives me; and he who receives me, receives him who sent me." Now there was at Joppa a certain disciple named Tabitha (which when translated, means Dorcas). This woman was full of good works and acts of mercy which she did. and said, 'Cornelius, your prayer is heard, and your gifts to the needy are remembered in the sight of God. May it never be. Yes, let God be found true, but every man a liar. As it is written, "That you might be justified in your words, and might prevail when you come into judgment." 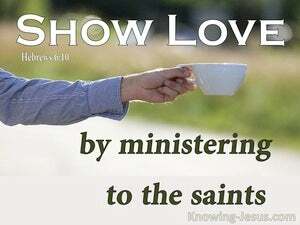 contributing to the needs of the saints; given to hospitality. Now concerning the collection for the saints, as I commanded the churches of Galatia, you do likewise. For you, brothers, were called for freedom. Only do not use your freedom for gain to the flesh, but through love be servants to one another. So then, as we have opportunity, let us do what is good toward all men, and especially toward those who are of the household of the faith. For even in Thessalonica you sent once and again to my need. From now on, there is stored up for me the crown of righteousness, which the Lord, the righteous judge, will give to me on that day; and not to me only, but also to all those who have loved his appearing. But do not forget to be doing good and sharing, for with such sacrifices God is well pleased. We know that we have passed out of death into life, because we love the brothers. He who does not love remains in death.